Such a wonderful chair. My hairstylist put this in her salon as guest chairs and they are such a fabulous look! We love them so much. Not extremely comfortable but good quality chair!! Safavieh Bandelier Off-White/ Light Oak Leather Weave Accent Chair - 25.8" x 31.5" x 30.7"
Safavieh Rural Woven Dining Bandelier Black Arm Chair - 25.2" x 20.9" x 30.9"
Safavieh Bandelier Off-White/ Light Oak Bench - 47.3" x 15.8" x 18.2"
Update your living room decor with the Safavieh Bandelier Light Oak Arm Chair. This stylish chair features a sleek mid-century modern style with a wooden construction in a light oak finish with a white woven seat to complete the look. Ordered 4 Safavieh Bandelier Light Oak Arm Chairs for my dining set and they're perfect! They are well made, lightweight, sturdy and large enough to comfortably seat a 240lb individual. On top if that, they're aesthetically pleasing. The arms and backing are perfectly positioned, which helps seating posture. All and all, I can find no fault with these chairs. Highly recommend. One arrived already broken, Overstock sent me a new one (thank you!) but within 6 months the others started breaking - the back completely snapped off! No warranty, so Overstock won't give me my money back - definitely won't buy this brand again! I am obsessed with the look of these chairs and I have purchased two of them. Tragically the wooden piece on the back of the chair just fell off one day and although we made an attempt to reattach it with wood glue it just kept falling off. Also the light colored leather will get dingy over time especially if you have children. Hopefully I just had bad luck with the back of one of the chairs falling apart. I should have tried to return it but didn't want to deal with shipping it back. They really are gorgeous and I am so torn over whether or not I will purchase another one to replace my damaged one. These are beautiful, well made, comfortable chairs with an amazing shape. I ordered 6 as dining chair and I am super happy with my purchase. My only concern is the unfinished wood. I have 2 kids under 5 and I have yet to find something to treat the wood to protect it from stains. I tried using Tung Oil & Howard Feed-N-Wax, but they completely changed the color of the wood (although it's a great new color, just not what I am looking for). I also ordered a leather protector to coat the seat, and it seems to have worked. One of the chairs arrived with a cracked frame, and overstock took care of the replacement immediately. This chair is exactly what I was looking for... in fact I waited for it to come back in stock on Overstock to order. I am so happy I did... I LOVE it. While it isn't a chair that you are going to curl up and read a book in, it's a wonderful piece for your room and a beautiful statement piece. I love that it is unique without being too out there. I am very happy with this purchase. The chair came fully assembled, very well padded and protected for shipping. Thank you Overstock! Gorgeous leather and teak chair! Very cool, modern chair. We have these in our kitchen. I am a designer and these chairs are fabulous and look amazing with our mid century modern decor. Best priced too! Get them while you can, they sell out fast! Very light wood, love it!! I couldn't speak highly enough of these chairs -- just completely redid the living room and these are my favorite pieces. Perfect modern look with a natural touch from the teak wood. If you're on the fence, these are a definite go! Just got these for our dining room and absolutely love them. They are simple, but the leather detail on the seat is attractive, stylish, and fits perfectly with my mid century and rustic decor. Highly recommend! Great quality. Well priced. I use it as an accent chair for my living room. 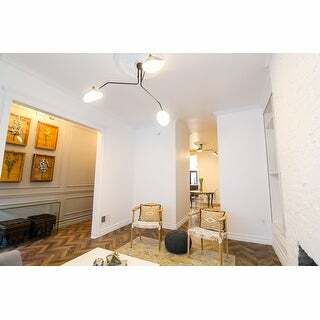 Looks terrific with my mid century and Scandinavian decor. LOVE! Arrived busted in multiple places. Wood is unfinished and looks cheaper than in photos. Returned. Chair arrived quickly, in perfect condition. Open the box and you have a designer-looking chair. Overstock had the best price around. Love love love it. Best price by far for this item was on Overstock. These chairs are amazing to look at and not at all uncomfortable. My only issue is, they are delicate. The wood is unfinished/unsealed and stains very easily. If you are going to use these in medium to high traffic areas I would seal/wax/etc! Good looking and surprisingly very comfortable too. Love them. 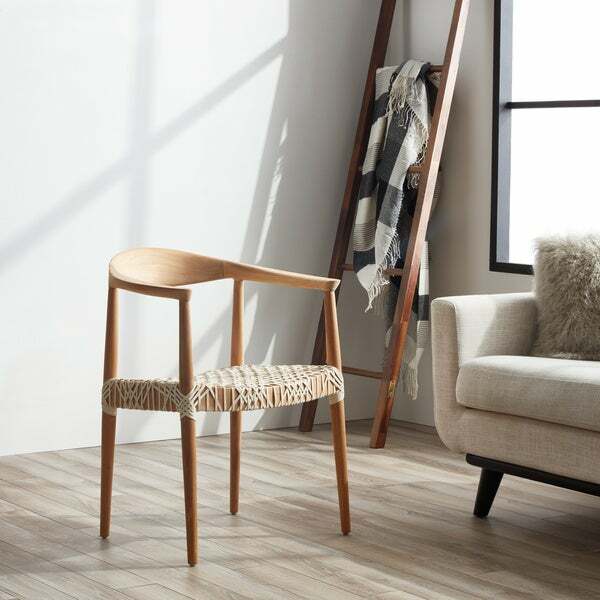 This sleek and chic chair has just the right mixture of curves and woven texture. Well made and sturdy, it would go great with a dining table or just on its own. 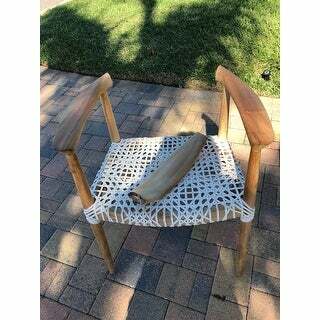 The woven seat is strong and the wood retains just the right amount of natural hue. This chair is incredible and exceeds my expectations. Sturdy and stylish dining chairs look great in our new house. Just as described! So excited. beautiful chair! The wood is lovely. "what is the height to the top of the arm? the 31'' is the height to the top of the back i believe. thank you." "Hello:) Are these chairs stack-able?" "I love the look of these chairs. I'm a bit concerned that the beautiful leather lace seat design will stretch with use--has anyone noticed this happening or are my fears unfounded?" 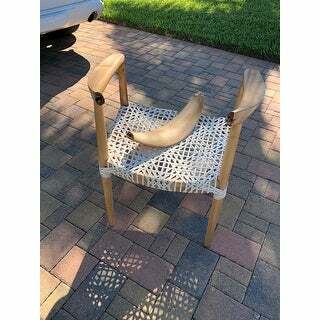 "Is the purchase price listed for a set of 2 chairs? The description is not clear. Also, does this really support a 200 lb person or less? ( as per a previously answered question). " The price is for 1 chair. I've had people over 200lb sit in this chair and it hasn't been an issue. It's a pretty solid chair. "What material is the seat lacing made from? Is it plastic?" "How sturdy is the chair? Is it better as a decor piece or will it survive regular use, in the dining or living room, for example. " This has a weight capacity of roughly 200 pounds. "what is the seat height? Details say 14.5 in but that seems very low." The seat height is 19".